Better late than never, right? I’ve been so enjoying taking a little time away from blogging that I skipped out on hosting this link up on Wednesday of this week. I know, #badblogger. But, I needed the break. I’ve been going HARD for almost 6 months straight! Anyhoo, this week I’m recapping my fav fall outfits, and it just so happens that I’m wearing a moto jacket in every look. 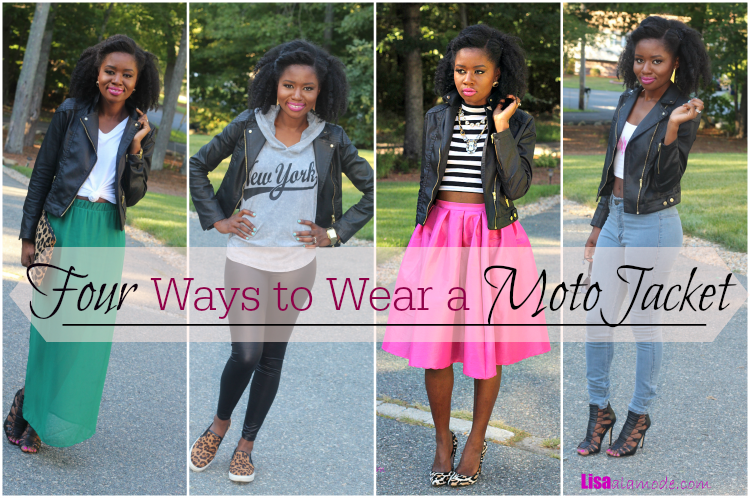 I have moto jackets in every color, from white, to pink, to blue, to denim, to yellow. If you don’t have one, please, for Love of God can you buy one? Seriously, it’s like having a blazer. And who doesn’t own a blazer?! Who? So yeah, You NEED one. 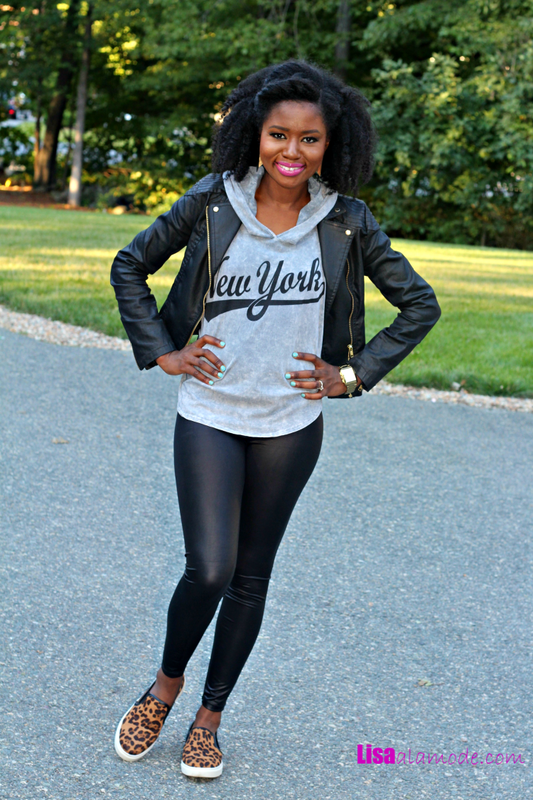 Anyway, without further ado, let’s take a look back at how I’ve been rocking my black moto jacket this fall. With a pink midi skirt. More details of this look can be found HERE. Buy this skirt HERE. With a Green Maxi Skirt. More details for this look can be found HERE. More details HERE. Buy these shoes HERE. This week’s featured blogger is Brooke from Pumpsandpushups. You can barely tell in this pic, but she’s sporting the cutest baby bump EVER, and I am beyond smitten with her perfect fall ensemble. Be sure to check her out HERE. Don’t forget to link up below for your chance to be a featured blogger next week! Link back to my blog or this post. Comment on this post and one other linker’s post. 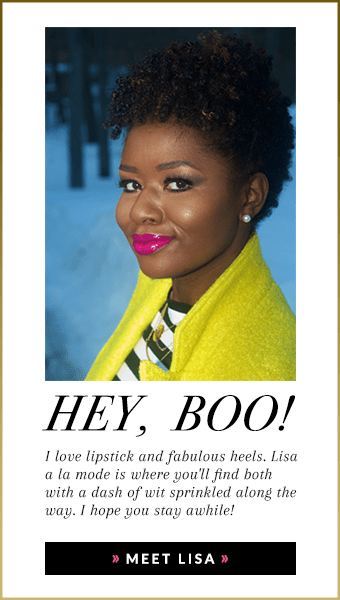 This is how you spread good blogger karma! I don’t even know where to begin because I absolutely love every single one of these looks! You look fantastic! If forced to pick just one, I would have to go with the pink midi skirt and black and white striped crop. You are wearing the heck out of these looks 🙂 Go girl! I love this. Great minds think alike…I posted a similar theme this week, too. You look amaze in all 4! 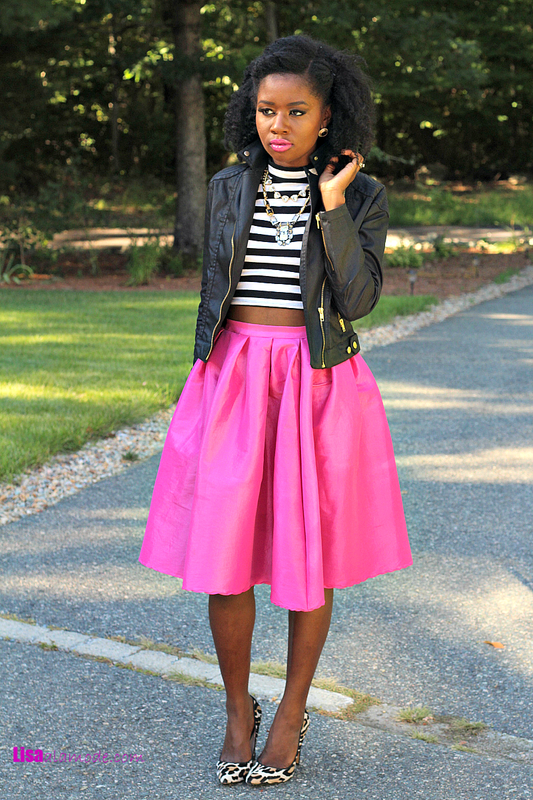 I see a lot of “pink” in the previous comments, I love a full, bright colored midi skirt. All the outfits are right on. I absolutely understand the need for a break, sometimes you have to take a breath. That black moto jacket is fabulous, Lisa. And you created some gorgeous outfits with it. I especially love how fun, girly and unexpectedly cool it looks with the bright-colored skirts. 4 gorgeous outfits I’d wear. Thanks for hosting the link-up and have a great weekend! Love these looks! I love them all! The outfits are amazing! The Moto brings edge to all of the looks. Loving all four of those looks Lisa! I just love these looks, especially the last one! 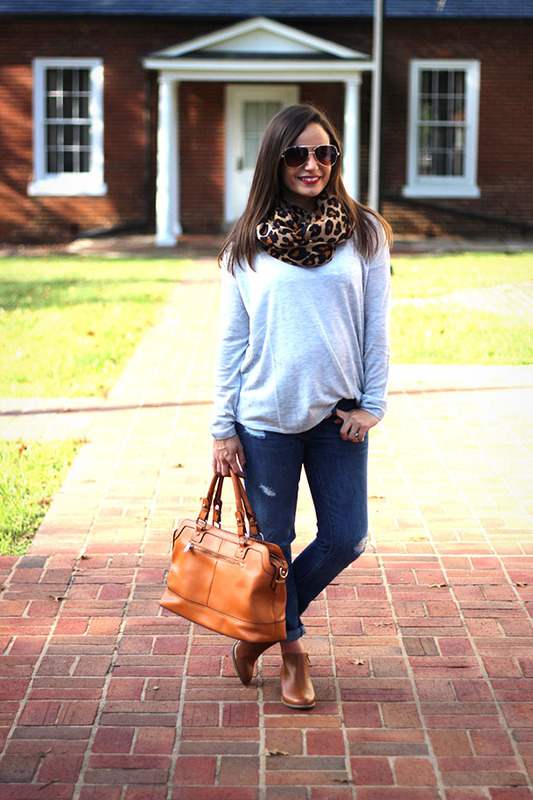 I’m a huge fan of the casual sweatshirt and the pop of leopard! Thanks, Sarah! I love super chill looks. Love all the looks but the pink skirt is my favorite!! Yes, all four times! You rocked this moto jacket for sure. LOVE!